My movie minutes: The Spark is Sporadic. Atlee's Raja Rani would have significantly raised the expectations of the audience for his second film Theri [Spark] mainly because of its star value.The greatest spark in the movie is the presence of Baby Nainika as Vijay's daughter and her cutest interactions and lovely rejoinders to her dad's words and actions.She kick starts the initial momentum of the film with the bike chasing the car and the dampening end up of the chase.There is certainly a spark in Vijay the police officer, caning the rowdies, who occupy a classroom in a government school for boozing and treating them with the thumb rules of teaching. 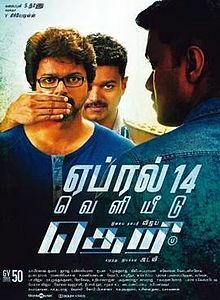 The sparks hit us here and there, at unexpected moments with a couple of bullet strokes ,one at the scene when Vijay is talking to Samantha's father at the coffee house in his usual humorous vein and the other when a sudden hit of a bullet, kills Samantha when she is asking Vijay how he rates her as his wife. The Shankar school impact is obvious in Atlee in the way he delivers fascinating visuals and stunning stunts with a kind of mega effect.But it stops with that.There is no continuity in making impact through each and every scene of narration, that one could find in Shankar. This is a young kid's attempt to parade through an action packed arena.Hence there is no continuity of the spark in narration .The absence of a separate comedy track or a professional comedian not joining the hero's hand, is perhaps another spark dowser, because however graceful Vijay's sense of humor is,it gets stereotyped after a particular point. Between the two heroines,Samantha scores higher, may be due to the fact, that she has been given more space for role play.The first meeting between Vijay and Samantha does create a spark with Samantha initially asking him to remove his cooling glasses and later on saying that he deserves to wear the glasses, because he has saved children suffering as beggars and street vendors in the hands of cruel rowdies.There are intermittent sparks as verbal flashes, in most scenes concerning Vijay and Samantha and those between Vijay and his most passionate mother Radhika. The outstanding spark of the film is the demonstration of villainy through J.Mahendran, the most noteworthy director of of the Nineteen eighties who made commendable movies like Nenjaththai Killaadhe,Udhirippookkal and some special Rajini films, like Mullum Malarum,Jaani and Kai Kodukkum Kai. Mahendran's unruffled looks, controlled dialogue delivery and subdued mannerisms create the much needed spark in most contexts.But the same way he seems to be helplessly made to look tamed and meek, in the climax scene, without any chance to let the spark come out of him.This eminent director who is capable of grander acting skills, could have been used more meaningfully by extracting more sparks of dynamics in acting, hidden in his directorial brain. The spark of G.V.Prakashkumar's music is confined to a couple of songs, particularly the one sung by the father and daughter at the very beginning of the film.I would not compare this film, citing theme and contexts of similarity, to other films like Baashaa,Chatriyan and Ramana as some reviewers have done . In those films the action segment was never found sagging.But here it is.May be it is due to the fact that here,one does not see action segment alone.There are more of sentiments, fun and breezy interpersonal links here, than in those films.It is not just a full fledged action film.It is on the other hand a Vijay film meant more for his fans, with his style and pep, to focus more on the actor's profiles of spark, rather than reflecting sparks of various formulations in film making, that one witnessed in Atlee's Raja Rani. Perhaps if the spark had permeated through out the film,it would have become an extraordinary Vijay film like Thuppaakki.